Urban gardens are popping up all over the nation, helping turn barren land into thriving examples of how people can come together for a greater good. A few have recently sprouted up in the city. What’s unique is that the plants are housed in re-purposed auto manufacturing shipping containers. From crates to plates, the Motor City showcases how it serves up fresh, local veggies to the community. It all started over a year ago when we brainstormed with supplier Ideal Group around greater uses for steel manufacturing crates versus selling them for the metal and plastic. The result: a re-use project that advances a city’s agriculture options and brings the community together. The partnership was the start of the Cadillac Urban Garden, which has increased in size over the last year thanks to our donation of 100 more crates. Volunteers doubled the plantings this summer, yielding 2,400 vegetable and herb plants. 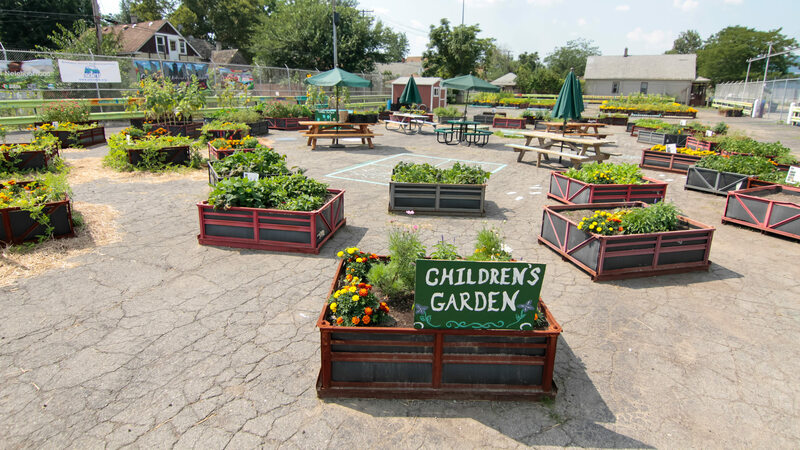 Many partners contribute to the garden’s vibrancy, such as the nonprofit Southwest Detroit Environmental Vision and numerous schools and youth groups. The effort provides nearby residents with free local produce as well as a beautiful community gathering space. It provides life to the street as neighbors come out, meet one another and get dirt under their fingernails. The garden’s success has led to 460 crate donations to Buckets of Rain, a nonprofit urban farming initiative supporting soup kitchens like the Detroit Rescue Mission Ministries and Cass Community Social Services. The program has transformed once-desolate urban spaces into 1.25 acres of plantings housed in recycled pallets and shipping crates. The harvest will provide food for thousands of underprivileged community members. Employee food scraps at our Hamtramck Assembly plant also help the plants grow. GM provides the material to Detroit Dirt versus throwing away, which turns into compost for the beds. Green Garage LLC also sought out our expertise when building its 1,000 square-foot rooftop urban garden, RoofTop Farm Detroit LLC. In a farm-to-table approach, it provides a weekly delivery of salad greens, small vegetables and edible flowers and herbs to Motor City Brewing Works restaurant located across the street. GM’s contribution of 90 strong plastic corrugated containers house the plants while 60 foam sheets from its Flint warehouse protect the building’s roof membrane under the planters. Beyond food sources, the nonprofit Mary McLeod Bethune Association Michigan repurposed 85 scrap Chevrolet Volt battery covers into customized planter boxes and bus stop seating along Six Mile/Pontchartrain Drive. GM’s donation assisted Bethune’s commitment, helping at-risk students’ hopes to beautify more Detroit neighborhoods and bus stops. Through these shipping crates and Volt battery covers, Detroit is growing food, beautifying streets, and most importantly building a sense of community. One example after another, the city continues to show its resiliency and revitalization from the ground up.